Maryland is known for its local seafood, harvested from the Chesapeake Bay and Atlantic coast. Maryland’s Chesapeake Bay seafood includes blue crabs, soft-shelled crabs, oysters, hard clams, soft-shelled clams, and other delicacies. Finfish include “rockfish” (striped bass), yellow perch, white perch, gray trout, drum fish, spot, croakers, flounder, bluefish, and others. On the ocean side, commercial fishermen harvest lobsters, blue crabs, hard clams, surf clams, ocean quahogs, oysters, sea scallops, flounder, sea bass, cod, whiting, red hake, gray trout, croakers, striped bass, bluefish, monkfish, tuna, sharks, and more. 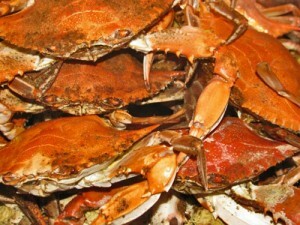 Maryland is also known for its seafood festivals. One of the more famous seafood events is the annual J.Millard Tawes Seafood Festival. The festival features Maryland seafood, local watermen, politicians, and festival lovers. Important Maryland seafood ports include Ocean City, Crisfield, Smith Island, Cambridge, Tilghman, Kent Island, Annapolis, Deale, and Solomons Island.